I adore home made chicken stock and love making it. As it simmers slowly the house is filled with its wonderful smell, making it feel happy and homely. Something wonderful begins to happen as the goodness and flavour from the chicken bones and vegetables seep into the water. More often than not it doesn’t actually make it as stock in my house as I can’t resist having a bowlful just as it is. The soothing broth is heavenly and healing. I believe in its magic. Remove any garlic, lemon, herbs, etc from the cavity of the chicken carcass and pull off any leftover meat, then put it into a large pot and just cover it with water. Halve about 2 sticks of celery, 2 carrots, one large onion and one leek and add to the pot along with about 6 peppercorns, a bay leaf a handful of parsley, and a few sprigs of thyme if you have some to hand. Bring to boil then very gently simmer on the lowest heat for about 2 hours. Remove any scum that comes to the surface during this time. After 2 hours sieve the stock and taste it. You may need to reduce it down to concentrate the flavour, in which case pour it into another pan, bring it up to the boil and reduce it until you’re happy with the taste. You’ll get somewhere between 500ml to a litre of stock out of one chicken. I totally agree. 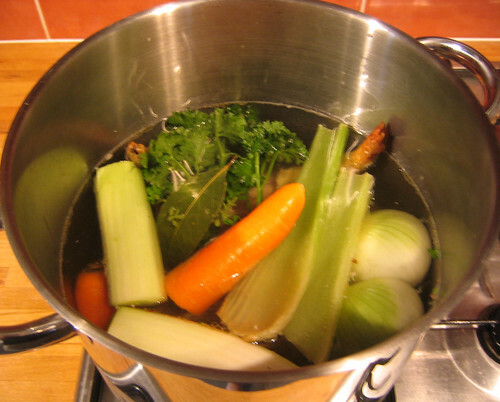 I love making chicken stock and in the winter there seems to be a pot of it in the making almost once a week. I recently discovered that slow cookers are an excellent way to make chicken stock. You put all the ingredients in the slow cooker and let it simmer over night. And in the morning you have this really rich, golden and intense broth that hob-top simmering just can’t produce. If you are making the stock for an asian soup like ‘Vietnamese Pho’ (recipe below) I really recommend throwing in a few slices of ginger and lemongrass as well. It adds another note of flavour to the stock. I can’t wait until I get my own place so I can start making chicken stock. It’s a bit difficult in student flats because there’s always some weirdo who gets grossed out by the boiling chicken carcass!